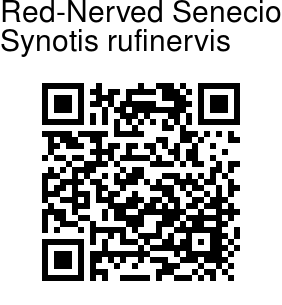 Red-Nerved Senecio is a tall aromatic woody herb, growing up to 3 ft tall. The leaves are shortly stalked, ovate long pointed, 5-8 x 2-4 inches, toothed sharply. Underside of the leaves is white except the nerves, thus the nerves appearing reddish. 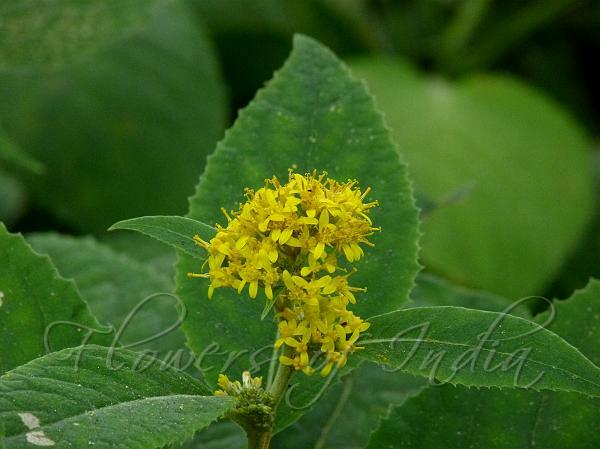 Yellow flowers are borne in velvety inflorescence of numerous flower-heads. Flower-heads are slender, 8-9 mm long, 6-10 in small rounded corymbs. Each flower-head has 2-5 ray florets. The roots are cylindrical. Red-Nerved Senecio is found in the Himalayas, in Uttaranchal and Nepal at the altitude of 1800–3000 m. Flowering: July-October. Identification credit: Gurcharan Singh Photographed in Dhanaulti, Uttarakhand & Manali, Himachal Pradesh.